I have always been slightly afraid of chickens … until now. Last weekend my partner and I had a long overdue opportunity to visit my sweet friend, Georgia and her backyard chickens. I’ve been meaning to go and see “the girls” ever since she got them, but have never actually been organized enough to catch Georgia while she had some spare time, being the vibrant, involved, active person she is. 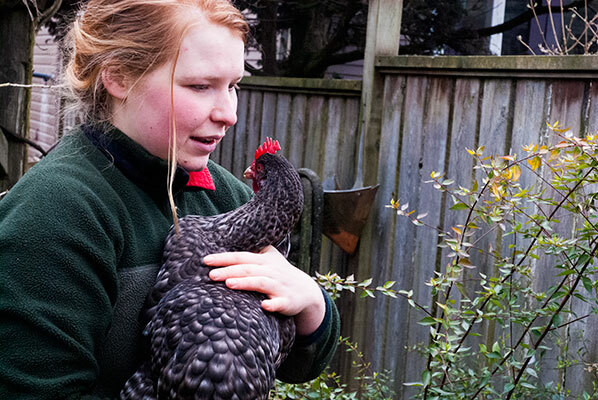 She recently finished a cross Canada bicycle journey – the chickens stayed home to bond with her Dad. She took us to meet them on a sunny Sunday morning, just as she was giving them a treat of leftover greens from the Granville Island Public market. Fantastic armloads of purple, green, lush and only slightly wilted greens … and a bag of leftover doughnuts. Georgia had brought the bounty home in the basket of her bicycle, the night before. 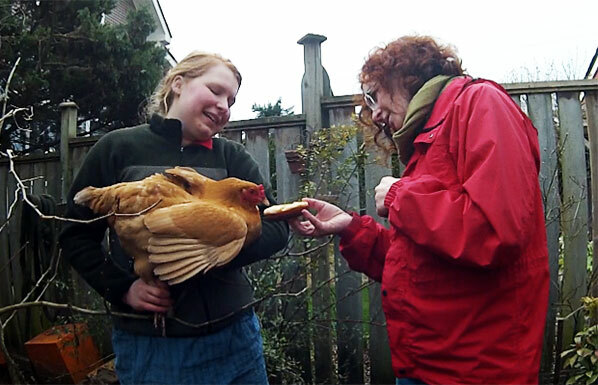 My partner and I were amused to see that chickens can be just like teenagers in their food preferences – they went for the doughnuts right away! 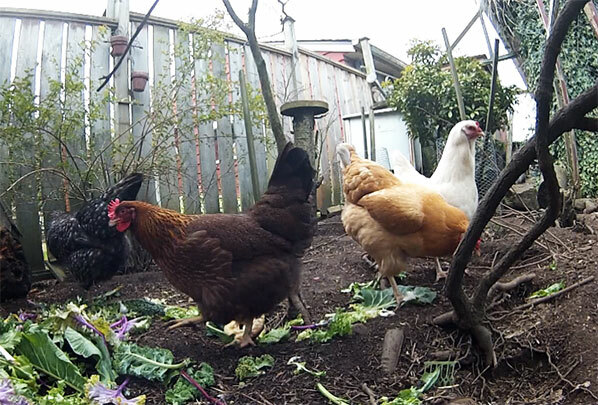 The hens eat worms, small slugs, layer pellets, and greens. They apparently also LOVE potato bugs, in all forms (larval and adult), which almost makes me want to get chickens for our own garden, then and there. 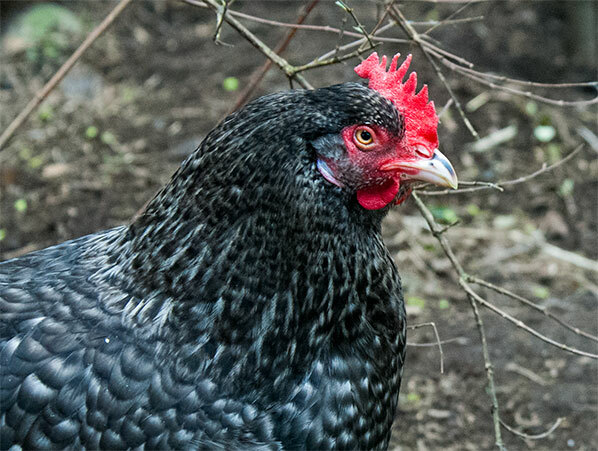 In Vancouver, you are allowed to have four hens – no roosters, as they are just too loud and aggressive. 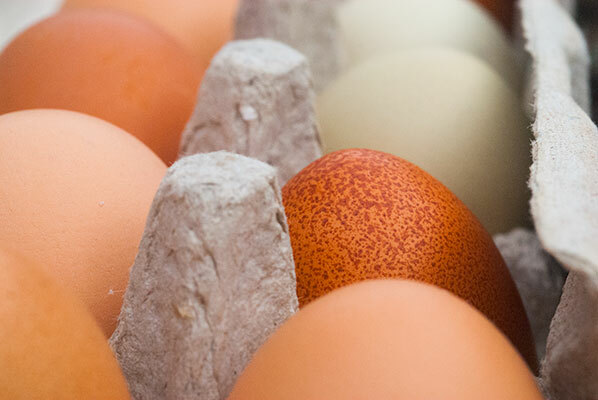 All of her hens are heritage breeds. On the top of the “pecking order’ is a beautiful golden bird called Jonathan Goldstein, named after the humorist of the same name. Apparently he was delighted when Georgia sent him a picture of his avian namesake. 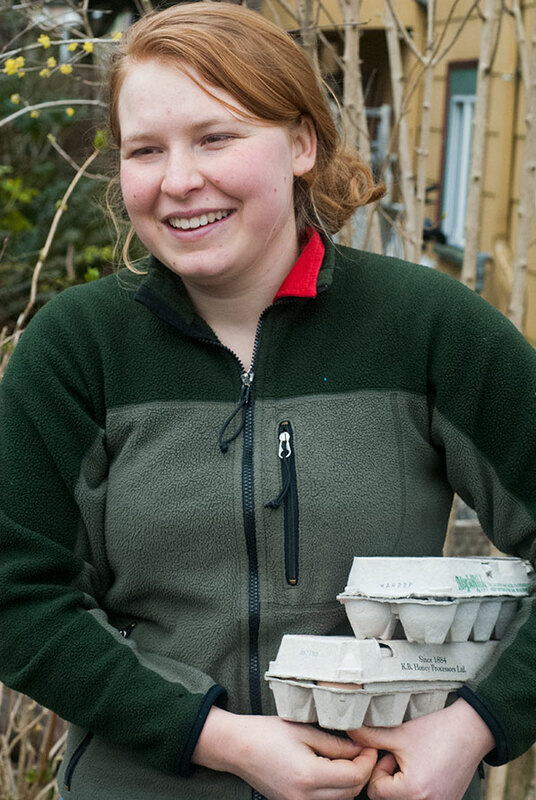 Jonathan and her solid white pal, Ptarmigan, lay lovely blue/green eggs. I am watching the hens obviously enjoying their picnic, jogging about, interested in every bug and green, as they make busy little clucking sounds of contentment. Not a ruffled feather to be seen, these girls are the picture of health and contentment. Achmed even let me hold her … for a moment. 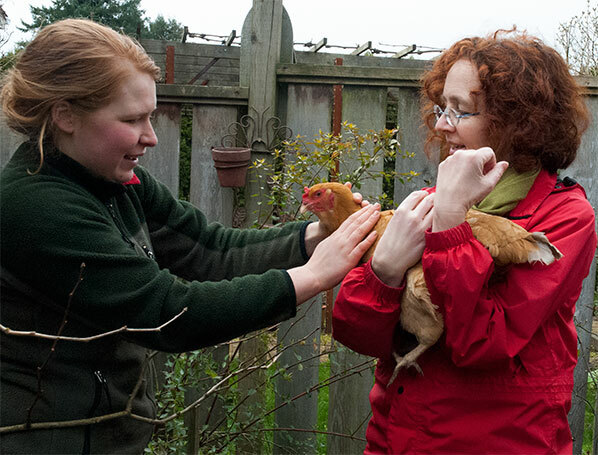 I think I like chickens – especially these happy girls. 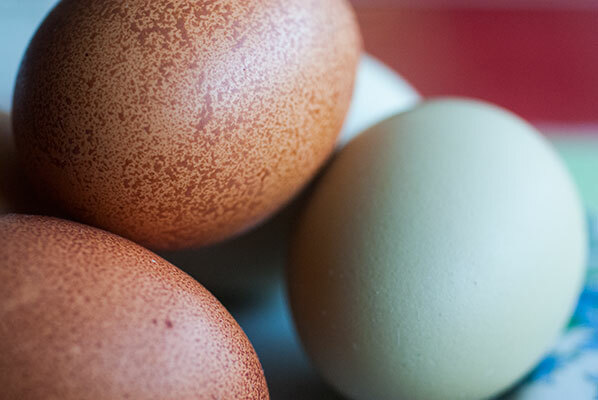 And the beautiful variations of colour in the box of eggs Georgia gives us to take home are evident here, from speckled, to brown, to the pastel green. 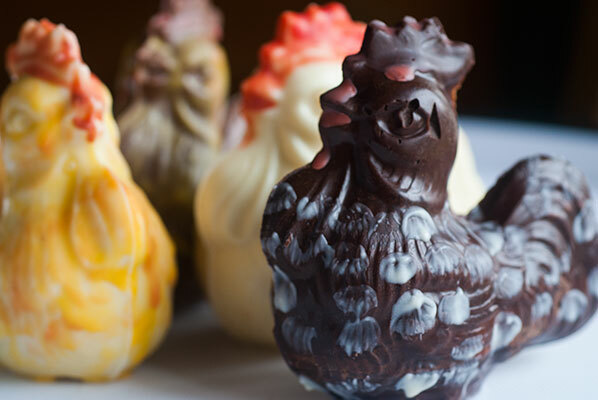 The next day, chuckling in a fair imitation of the poultry girls, I dug out my old-fashioned, double-sided metal chocolate mold. I bought it a year ago and have never used it. 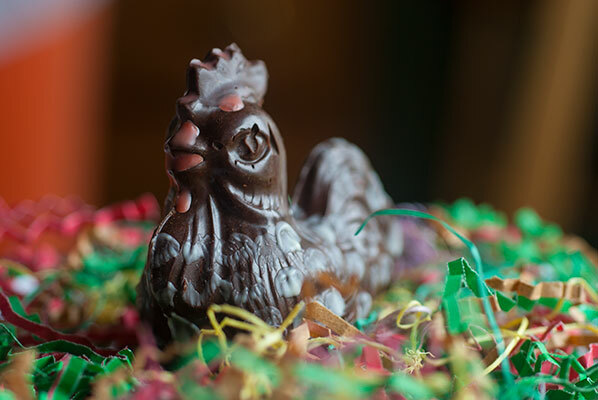 It is, of course, a chicken, and will be my base model for chocolate versions of Jonathan Goldstein, Ptarmigan, Achmed and Isa. I check my mold. Shiny. 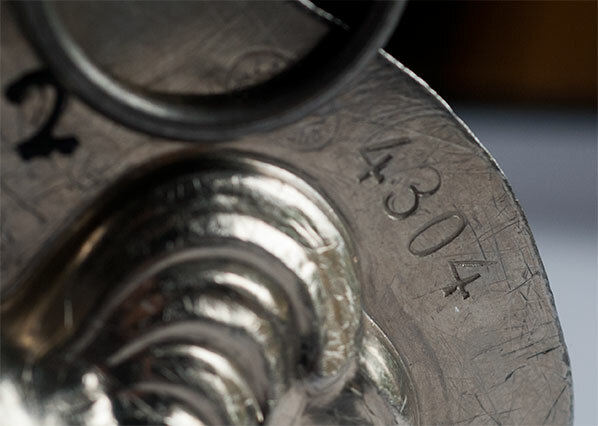 The next step is to put the mold together with its circular clips, hold it up to the light, look into the bottom to see if any large gaps are visible, with light showing through. If there were, this would be where the liquid chocolate, when poured into the mold, would leak. Fortunately, with the addition of two large office alligator clips, the seal of the two halves looks tight. I wedge the mold upside down into a large Styrofoam sphere we keep in the bedroom closet. Why do we have a large Styrofoam sphere? Bought for a Science class project and never used – it has become fantastic for chocolate work since we squared off its bottom, and is now covered in bits of hardened chocolate. 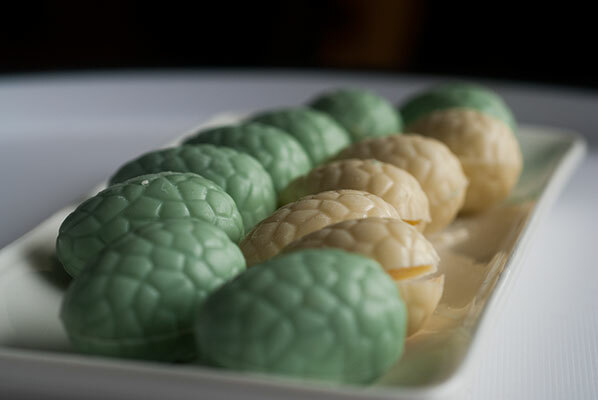 I am always tempted to pick them off and eat them, but the embedded Styrofoam would not add texture in a good way. My first attempt is with white chocolate. I always use the white chocolate as the tester, as I am never so upset if it doesn’t work. After tempering 150 grams of white Callebaut couverture in a four cup measure, using the seeding method, I pour it carefully into the bottom of the mold, pausing at intervals to gently tip and tap the whole mold, in order to knock out any air bubbles, and to ensure total coverage of the interior. Then, wedged into the Styrofoam sphere, it goes into Younger Son’s bedroom (the coolest room in our house, poor dear). A couple of hours later, the moment of truth has arrived … I think. Not being able to see the chocolate begin to pull away from the side of the mold, as one would with a poly-carbonate mold (the bottoms of the cavities take on a cloudy appearance as the chocolate pulls away), I shake the mold slightly, then release the clamps. I wedge a thin bladed knife between the flanges of the mold, and gently pry the two halves apart. And it has worked, beautifully. 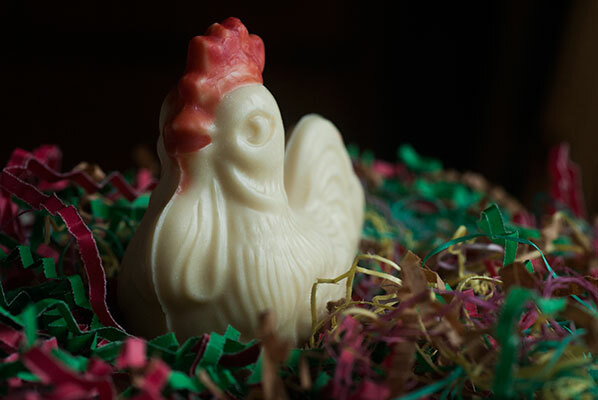 Out pops a well-defined white chocolate chicken and – forgive me – I crow with delight. Here is my Ptarmigan base. My plan is to do wattles, beaks, crests and feather patterns in contrasting tinted cocoa butter … oh, this is going to be interesting. Flushed with success, and loving this mold, I do one more in white chocolate, for Jonathon G., who I will “paint” with yellow cocoa butter. She is followed by a dark chocolate Achmed, and a milk chocolate Isa. When they are all lined up, I temper the cocoa butter (exactly the same method as tempering chocolate), then colour it with drops of oil based food colouring (mine is from Americolor). 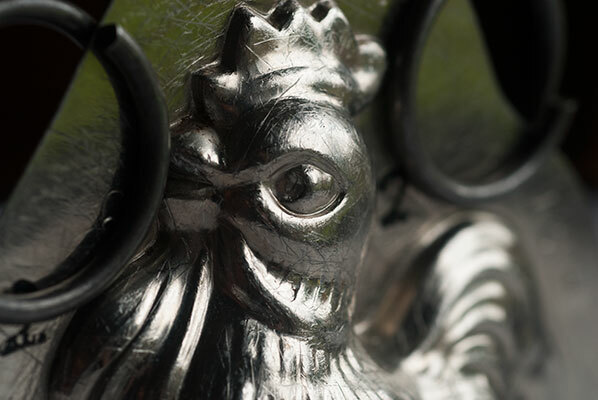 As Pam wisely says, on the Ecole Chocolat website – “always oil with oil”. If you were to try to use water based food colouring, the coca butter would separate or seize. I have never tried powdered colour, but it will also work. I did a batch of red and a batch of yellow, then got to work. Cocoa butter is great fun to use, but my colours were translucent when wet, so I had difficulty judging how much was “enough” as I painted. I ultimately had mixed success, as can be seen! I am quite happy with the way Ptarmigan (solid white) turned out, but poor old Isa ended up looking as though an enthusiastic pre-schooler painted her! It was easier to see the colour going on the white chocolate, so Jonathan G. looks not too bad. For Achmed (the spotted dark one), I brushed on tiny amounts of tempered white chocolate with the tip of a fine paintbrush. For a final homage, I tempered 250 grams of white chocolate, and tinted it with 3 drops of Chef Rubber’s Artisan Collection Regal Blue coloured cocoa butter. 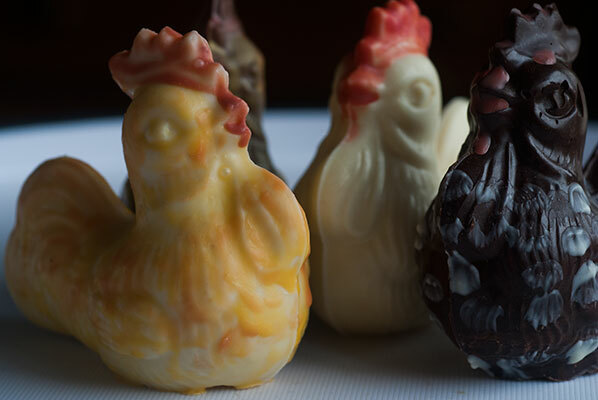 The resulting colour was perfect for a molded batch of small chocolate eggs. The reason I’ve not used it is because it scares me. 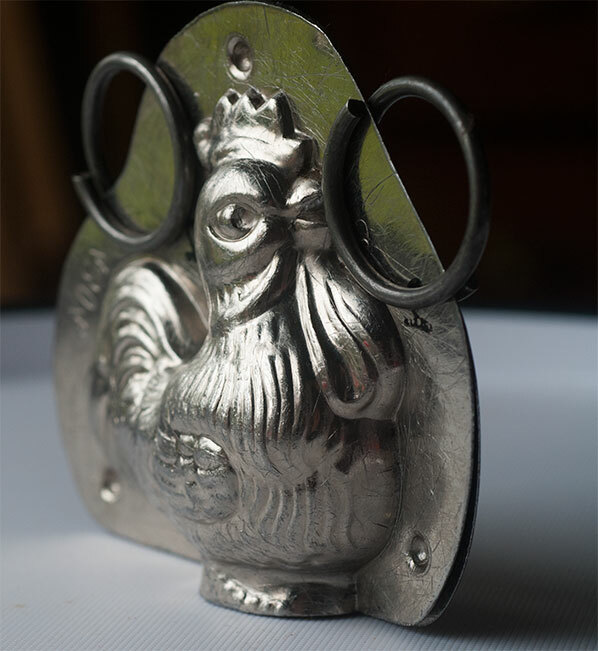 But like the chickens, I think I have learned to love this mold. 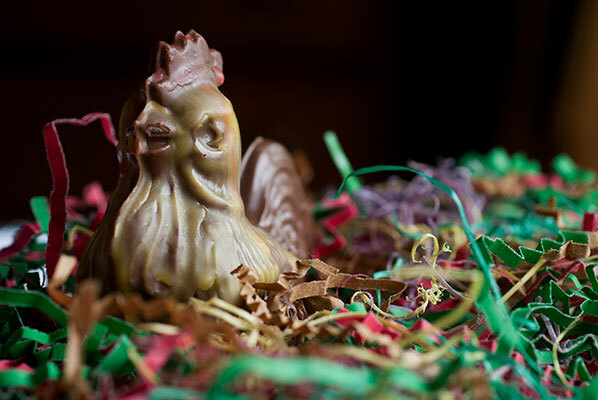 Easter is long past, but these happy chickens and eggs were such fun to make, I think I’ll hop over to Georgia’s house and leave her this FOWL little surprise.